An investigation conducted by the NFL found that the New England Patriots used deflated footballs in the AFC Championship game against the Colts, and one Indianapolis-based cartoonist has the perfect response. 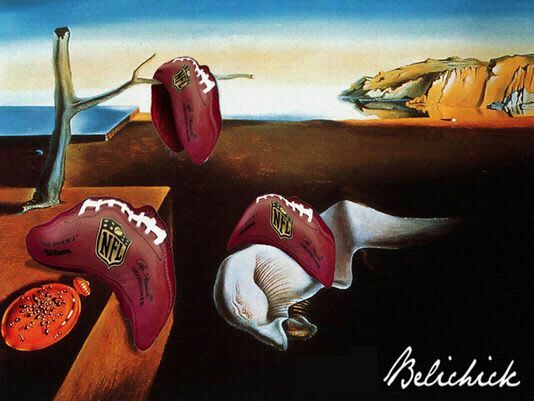 The cartoon from the Colts&apos; hometown newspaper The Indianapolis Star shows limp, deflated footballs in the style of Salvador Dali&apos;s melted clocks from The Persistence of Memory. The cartoonist Gary Varvel posits on Twitter that this would be the result "If [Patriots] Coach Bill Belichick takes up painting." Varvel is surely just one of many irked Colts fans who, despite getting blown out in the game 45-7, probably can&apos;t help but feel like they got a raw deal by what the cartoonist refers to as the Cheatriots. Now, our only question is where was Varvel when the Patriots&apos; Spygate scandal was going down?